The operating room equipment & supplies market is projected to reach USD 29.15 Billion by 2020 from USD 24.31 Billion in 2015, at a CAGR of 3.7% in the next five years (2015 to 2020). The growth of the overall operating room equipment market can be attributed to the growing investments, funds, and grants by government bodies worldwide, rising number of hospitals, increasing patient preference for minimally invasive surgeries, growing number of regulatory approvals for operating room equipment, and growing number of geriatric population coupled with the increasing number of surgeries globally. In the coming years, the operating room equipment market is expected to witness the highest growth rate in the Asia-Pacific region. The high growth in the region can be attributed to growing number of hospitals in Asia, increasing number of German-Asian partnerships in Asia, government initiatives to increase the number of doctors in China, Japan’s growing healthcare industry, government funding in India, favorable healthcare system and conferences in Australia, increasing medical tourism in Thailand and Singapore, and increasing government investments in Philippines among others. North America is expected to account for the largest share of the global operating room equipment market. North America’s leadership in the market can be attributed to the investments by hospitals to upgrade operating rooms; rising number of surgical procedures; increasing number of ambulatory surgery centers; and increasing prevalence of cardiovascular disease in the U.S. In Canada, market growth is mainly driven by rising public and private investments, implementation of a new funding model for Canadian hospitals, and conferences on operating room equipment and supplies. The report segments the market based on product, end user, and region. Operating room supplies is expected to account for the largest share of the market in 2015 and is expected to register highest growth rate. The highest growth rate of operating room equipment market can be attributed to the growing incidence of chronic diseases, increase in the number of surgical procedures, and rising geriatric population. In addition, governments across various countries are taking regulatory actions to fortify hospitals with the essential infection control standards to prevent the spread of HAIs (hospital-acquired infections), thus boosting the demand for operating room supplies. STERIS Corporation (U.S.), Getinge Group (Sweden), Stryker Corporation (U.S.), Hill-Rom Holdings, Inc. (U.S.), Drägerwerk AG & Co. KGaA (Dräger) (Germany), GE Healthcare (U.K.), Mizuho OSI (U.S.), Philips Healthcare (The Netherlands), Medtronic, Inc. (Ireland), and KARL STORZ GmbH & Co. KG (Germany) are some of the key players in the operating room equipment market worldwide. The global operating room equipment market is segmented on the basis of product, type, and end user. By product, the market is categorized into operating room supplies and operating room equipment. The operating room supplies are estimated to account for the largest share of the global model market, by product. It is also expected to be the fastest-growing market segment owing to the growing incidence of chronic diseases, increase in the number of surgical procedures, and rising geriatric population. In addition, governments across various countries are taking regulatory actions to fortify hospitals with the essential infection control standards to prevent the spread of HAIs (hospital-acquired infections), thus boosting the demand for operating room supplies. On the basis of type, the Operating Room Equipment Market is segmented into Anesthesia Machines, Electrosurgical Units, Multi-parameter Patient Monitors, Surgical Imaging Devices, Operating Tables, and Operating Room Lights. In 2015, Anesthesia Machines is expected to command the largest share of the global operating room equipment market, by type. On the basis of type, the supplies market is segmented into Surgical Instruments, Disposable Materials, Accessories, and Other OR Supplies. Other supplies include OR safety products, procedure trays & packs, kidney trays, table pads, circuits, and battery handles. In 2015, Surgical Instruments is expected to command the largest share of the global operating room supplies market, by type. The research report also covers the operating room equipment & supplies market by end user, which includes Hospitals, Outpatient Facilities, and Ambulatory Surgery Centers (ASCs). In 2015, Hospitals are expected to command the largest share of the global operating room equipment market, by end user. Growing investments, funds, and grants by government bodies worldwide, rising number of hospitals, increasing patient preference for minimally invasive surgeries, growing number of regulatory approvals for operating room equipment, and growing number of geriatric population coupled with the increasing number of surgeries globally are some of the factors that are expected to drive the growth of the global operating room equipment market in the coming years. On the basis of region, the operating room equipment market is categorized into North America, Europe, Asia-Pacific, and the Rest of the World (RoW). 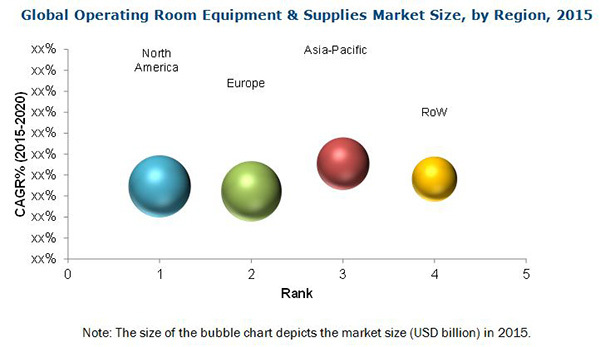 The Operating Room Equipment & Supplies Market is expected to be dominated by North America, followed by Europe, Asia-Pacific, and the Rest of the World (RoW). Asia-Pacific is expected to grow at the highest rate during the forecast period. 9.2.1.2 Increasing Surgeries in the U.S.